Warning: This contains spoilers. 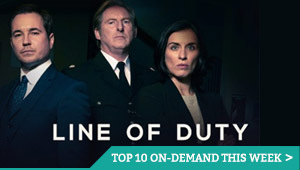 Not seen this episode yet? Catch up with our reviews of Horace and Pete so far here. Horace and Pete began with an email from Louis C.K. on the 30th of January with the subject line ‘A brand new thing from Louis C.K.’. The email went on to say that the first episode of Horace and Pete was now available for $5 from C.K.’s site. There was no explanation as to what exactly Horace and Pete was or how long it would run for. In an age where every new show is written about from the second it’s conceived until the moment it goes off air in intense detail, there was something strangely thrilling about leaping into the unknown. This past Saturday, another email arrived, as they had done every Saturday since the first episode, informing everyone on C.K.’s mailing list that Episode 10 was now available. There was nothing particularly special about the email, but as the episode went on, it started to feel like this might be the end. And so, without any warning, Horace and Pete finished, with an episode that represented some of the greatest work C.K. has done with the show. And not really knowing until the credits rolled that this was going to be the end made the experience all the more affecting. Episode 10 was split in two, between a flashback and a second half that returned us to the present day and brought the series to a conclusion. Horace and Pete has been, from the very beginning, about the way in which things do – or, more importantly, do not – change over time. It’s been about the way in which abuse and pain travels down through generations and the way in which an institution, in this case a bar, can be the glue that holds people together and a prison that locks them in a traumatic and toxic situation. In returning to 1976 with this final episode, C.K. shows us a clear view of the wretched environment that led all the characters we have seen to the point they were at when we joined them in the very first episode. 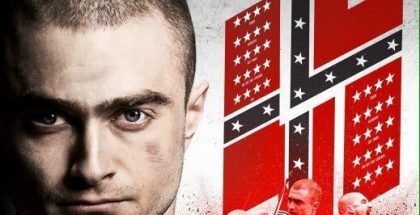 None of this was exactly news – many of the characters almost obsessively talked about the past – but it’s something else to see it and experience it. A moment in which Horace (Louis C.K.) and Sylvia’s (Edie Falco) mother, Marianne – also played by Edie Falco – leaves her husband is something we already knew about, but actually seeing it play out, through a beautifully and brutally crafted series of shots, helps you understand it on a more visceral and emotional level. You feel the trauma in that scene and you experience the pain. As Marianne makes her escape from her abusive husband – also played by C.K. – she uses a moment in which he is distracted by beating the young Pete, who has just been displaying obsessive compulsive behaviour. The young Pete clearly has problems, but as we’ve heard before, he was a bright and happy child who was good at sport. The latter leads to a moment in this early section in which he comes in the bar and happily declares how well he’s done. The man he believes to be his father doesn’t seem to care, but his real father, Uncle Pete, encourages him and shows a brief moment of affection. But when Horace VII is beating Pete and Marianne is making her escape, Uncle Pete hovers for a moment at the base of the stairs, the sound of his son’s screams echoing through the bar, before walking back into his room, the room that Pete would one day move into, his mental health problems now so severe he can’t live outside of the bar. This sequence is the most shocking and upsetting moment in a series that has had its fair share of hard-to-watch scenes. The behaviour of Horace VII and Uncle Pete is appalling and horrible to witness. This is a show about awful people messing up their kids, though, and while we may see the humanity in these characters at times – there were a number of times we actually saw good in Uncle Pete – the negative ways in which they have affected their children are inescapable. But their children can escape becoming their parents, if they try. Or at least, there’s the glimmer that this could be possible, even if we don’t see it happen. 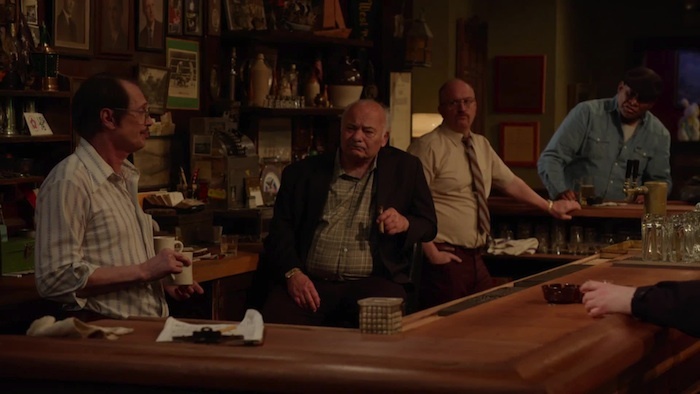 The first scene in Episode 10 features Marianne telling the young Horace and Pete to be quiet, warning them: “You’re gonna wake up your father.” One day, they could very well wake up and be their father. Sylvia has previously made it clear what a toxic environment the bar is, a toxic place run by a bunch of terrible men. She, like her mother, had had enough and wanted to escape, but circumstances sucked her back in. In 76, we see how totally run by awful white men the place was, with Horace VII, Horace VI (Burt Young) and Uncle Pete – the younger version of Alda’s character, here played by Steve Buscemi – all behind the bar and ruling the roost. They are racist, sexist, homophobic and they are totally unchallenged. When Marianne attempts to leave at one point – prior to the aforementioned escape – Horace VII drags her back through the bar by her hair. No one so much as comments on what’s going on. 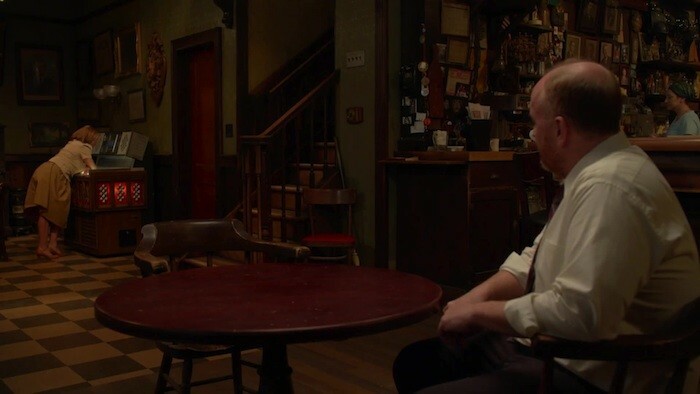 If Horace and Pete’s, the bar, is an allegorical stand in for America – as it has often seemed to be – then the portrait is far from a flattering one. When the episode returns to the present day, the world hardly seems much rosier, but Sylvia is in more of a position of power than her mother could ever have been, and while Horace VIII is far from a saint, he has been trying to break the cycle and not be the man his father, or grandfather, was. But he’s still upholding this toxic institution and trying to honour its memory, even if he should perhaps be starting afresh. Perhaps there’s nothing there worth remembering. In a scene that is jaw-droppingly well-acted by both performers, into the bar walks Mara (Amy Sedaris), who lifts Horace’s spirits and helps him reach the feeling that he needs to go in search of something new, something he’s been unable to see throughout the series. He’s been a man paralysed in so many ways, and consumed by darkness, but she allows him to see some light and want to look for more. Mara comes looking for a job. It’s the worst possible time, though, as Horace has just been told that the police are going to stop hunting for Pete, as there’s no chance that he’s still alive. Horace is, at first, unable to process this and just gets angry, but the reality slowly dawns on him and he begins to cry. This emotion pouring out of him is intensified because Sylvia has told him again that he needs to do something, that he is rotting in this bar and needs to get out. She’s finally done with it and is leaving in a couple of days. Mara blasts in like a hurricane of good will and affection and insists that Horace interview her. She is well traveled, or so she says, and is impulsive and carefree. She is everything that Horace is not. Sedaris is a force of nature in this scene, her character so quickly defined and every movement in her body and inflection in her voice working in unison to tell us so much about her. Even small details about her costume – an empty badge that intriguingly recalls an election badge, for instance – make you lean in and want to know more. And, most importantly, she enraptures Horace and changes him. C.K. does a great deal in this scene too, as a performer, moving from inconsolable sadness to wide-eyed optimism in just a couple of minutes, in a way that feels absolutely genuine and not at all forced. Before Mara leaves, she puts a song on the jukebox: America by Simon and Garfunkel – Simon actually cameoed in the 76 section – and as the music fills the bar, Horace’s shifting outlook slowly reaches a conclusion. The song is one of Simon and Garfunkel’s most beautiful creations – from a back catalogue filled with emotionally complex pop songs that are practically cinematic in their approach to meaning and narrative – and it tells the story of people looking for America, people searching for something that they feel is lost, something optimistic and beautiful. Bernier Sanders recently used it for a hopeful ad campaign – a fact that C.K. was no doubt aware of. As the song builds, Horace tells Sylvia, with a smile on his face, that he knows what he wants to do. But we never find out what it is. Into the bar walks Pete (Buscemi), looking disheveled and with a manic look on his face. Horace goes to him, excited that his brother has returned. But Pete goes for a knife left on the bar and as the scene cuts to black and a scream rings out from Sylvia, Pete stabs Horace dead. 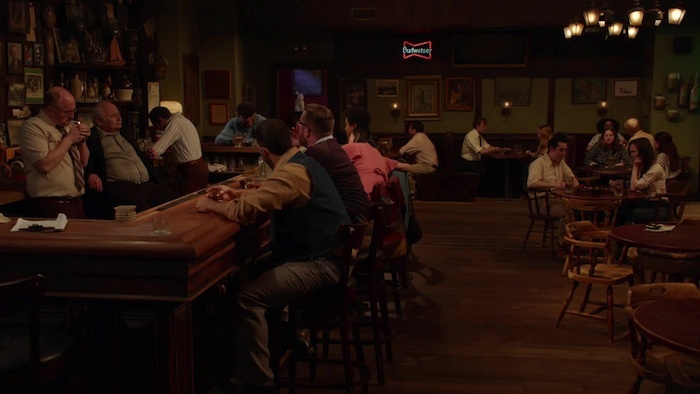 As Sylvia’s partner Harold informs someone else, Horace and Pete’s is a bar in which there were generations of Horaces and Petes and then Pete killed Horace and Pete was locked up. And that’s that. They couldn’t escape the past, the sins of their fathers and their many problems ultimately destroyed the institution. The series ends with Horace IX – Horace’s son – coming to the bar for the first time, as Sylvia is packing up to leave. He asks Sylvia about his father but she can’t muster up much of a description. Horace never escaped the legacy of Horace and Pete’s and C.K. smartly makes this pain even more greatly felt by giving Horace a brief moment of realisation in the seconds before he died. He could have gone searching for something more, for an America worth living in, but he just left it too late. As Sylvia finally breaks down, her hard exterior cracking under the weight of the tragedy that has taken place in the bar, not just recently but for decades, it’s impossible not to cry deeply with her. 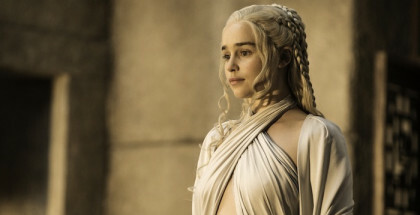 A fitting and absolutely devastating end to a brilliant series. Horace and Pete available to watch online on Amazon Prime Video as part of a £5.99 monthly subscription. It is also available to stream and download from Louis CK’s website in up to 1080p in any country. Horace and Pete Louis C.K.